Info: Rise of Incarnates is a free-to-play online fighter developed by the team behind the Tekken and SoulCalibur franchises. 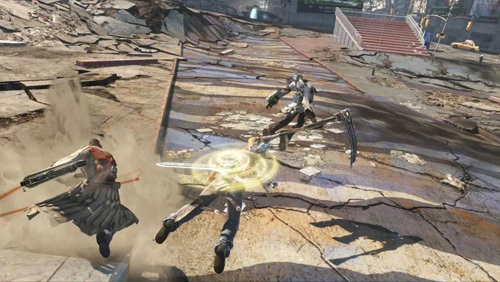 The game features avant-gardist 2 vs. 2 gameplay, a multitude of characters and roles, and battlegrounds throughout shattered yet accurately rendered real-world cityscapes. • Furious 2v2 combat – within an ever-evolving battle Incarnate duos wage mortal battle. Employ mental resolve, reflexes, and strategy as you run, jump, and fly through the true 3D arena engaging in close-quarter combat and long-range assaults. • Characters and classes for all levels of play – Unique Incarnate powers in diverse classes enable you and your partner to form original team compositions, discover unparalleled strategic depth, and experience levels of camaraderie unavailable in modern competitive games. • Awaken untold powers – Harness and unite your powers to decimate all. • A ravaged world – the familiar cityscapes show a world on the brink. Tragedy must be averted. After a week of playing Hearthstone, I wanted to discuss my thoughts and impressions of the free-to-play gaming model.